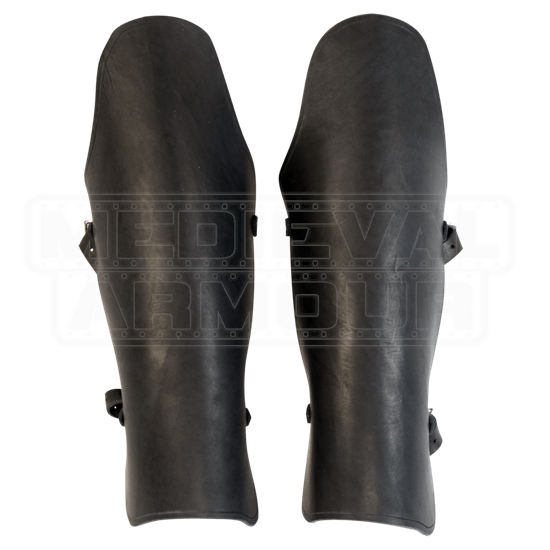 Similar to the greaves worn by Russell Crowe in the movie Gladiator, these leather greaves are made of thick armor grade leather (13/15 oz.) and have two buckles in the back for securing them on to your legs. They are made to your specific measurement. Please note that these are designed to cover your knee. We ask for your measurement from top of foot to top of knee. This is how long the greave will be. At the widest point, around the calf area they are 10.5 wide. Available in black, brown, dark red, royal blue, or green. Select the measurement closest to your actual measurement from the top of your foot to the top of your knee. For $69.00, you're not getting one, but TWO leather greaves. These things are much more thick than I had anticipated. They are very solid and fit very comfortable. I'm really quite amazed. I am using this to go with a Jedi costume in addition to the Gladiator Pauldron I also purchased from here. I totally see myself using these greaves for other things aside from larp, costuming, etc. such as possibly even motorcyle (when I learn to ride) as well as other outdoor activities. These would probably best go with leather gaiters worn underneath. I purchased the 20" size and it securely fits from my ankle to my knee. I'm 6'4" and I'm glad to have an item that can go with my height. The straps are adjustable.